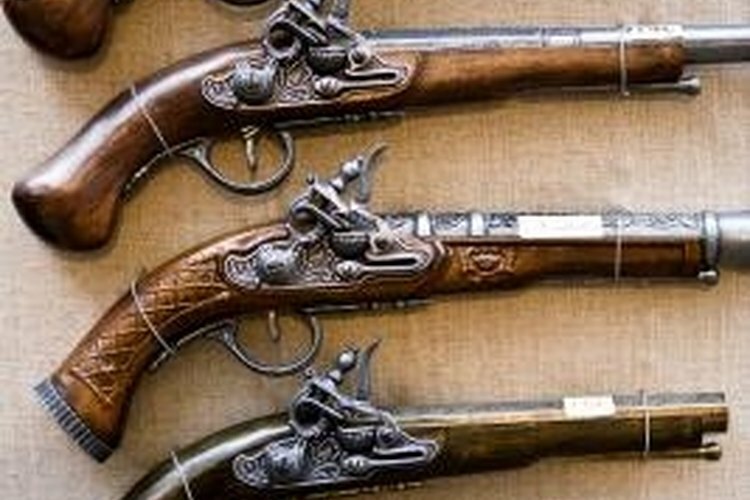 Antique guns, unlike newer models, aren't required to have serial numbers. Running a gun serial number search is essential if you’re looking to buy a used gun from an individual or a dealer. While it is illegal for dealers to sell guns that have been lost, stolen or used in a crime and wanted by the police, it can happen. Private-party sales of stolen guns are also uncommon, but can occur. Running a gun serial number search before you buy will make sure you get a gun that you can legally own and register in your name. Locate the serial number for the gun you want to check. If you are purchasing a gun or checking one that is already in your possession, you can check the documentation that came with the gun. In many cases, the serial number will be noted in the owner’s manual. If you don’t have the owner’s manual you will need to locate the serial number on the body of the gun. The serial number is usually located on the handle or inside the gun, but this does vary from manufacturer to manufacturer. Contact a reputable gun dealer in your area and ask them to run a serial number search for you if you’re looking to buy a gun from a private party. In most cases, the dealer will charge you a small fee for this service. However, this is often the fastest, simplest method. Many gun dealers will be able to give you basic records about where and when the gun was registered. Check your local department of law enforcement’s website to see if you can run an online gun serial number search. Some states do not maintain a database that individuals can access, so this method may not work in all areas. If you can’t find the database, contact a law enforcement representative and ask if an online gun serial number search can be performed in your state. Contact your local police department or sheriff’s office to run a gun serial number search if you are looking to purchase a pre-owned gun from a dealer. Police records will indicate whether the gun has been used in a crime or has been reported lost or stolen. Checking the serial number with the police department or sheriff’s office is beneficial if you’re considering buying a gun from a dealer because they can quickly check whether a gun was used for a crime or reported stolen in all states using the national ATF database. Check the Gun Verify database if you are purchasing a pre-owned firearm from a dealer or individual to make sure that it is not stolen. Gun Verify is a user-based database, meaning gun owners input their own information if their gun is lost or stolen. If you can’t find your gun’s serial number on the body you should contact the manufacturer. If you know the model of your gun they will likely be able to tell you where you can find the serial number right away. If you don’t know the model, a description or photograph may be necessary in order to locate the serial number. Private websites like Gun Verify can be helpful in finding information about a pre-owned firearm and they’re easy to use. However, that doesn’t mean you shouldn’t use other resources to check the serial number if there is no Gun Verify match. Do not buy a pre-owned gun if the serial number appears to be missing or has been filed off. This is illegal in some states, and in many cases, it means the gun has been stolen or used for a crime. Antique guns may not have serial numbers, but be sure to do your homework to make sure the particular model you’re looking at wasn’t imprinted with a serial number before you buy it.